Casinia Casino Welcome Bonus 100% up to €500 + 200 Extra Spins! 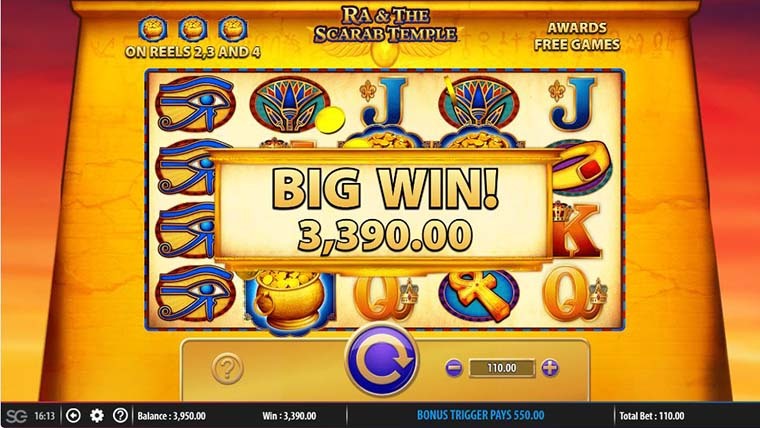 Return to ancient Egyptian tombs to explore new and never before seen treasure with this online video slot from Williams Gaming. Ra and the Carab Temple has 40 paylines across a 5 reels and 4 rows structure. Playable on any device from a minimum wager of €0.55, this online game is packed with thrilling features. You can expect Free Spins, where you can choose to play up to 30 such extra spins; and also multipliers, a jackpot and many more. With an RTP of 95.85% and such a diverse offer of bonus features, this slot is a treat both in terms of entertainment and payouts. Radiating Wilds – is triggered when any portion of the Stacked Obelisk symbol appears on the reels. If the feature is triggered, the Obelisk and adjacent symbols will turn into Scarab Wilds. Red Envelope Jackpot – triggered at random, before any spin during the main game. One Red Envelope appearing on reels 1 and 5, awards the Jackpot.